The Jasper City Council postponed the Recognition of Harold Cantrell for another month since he was unable to attend. Older Boy Scouts from Troop 836 were in attendance to earn their Citizenship/Community Merit badge by choosing a topic on the agenda to report back to the Scoutmaster and committee. Their report will include any controversy or if it is good or bad for the community. The council approved to continue to use Blue Cross/Blue Shield for the insurance provider for the city employees. Jasper ArtFest, a Juried Fine Arts show limited to 80 booths on April 16 & 17, was approved to take place on Main Street and the street will be closed from the blue building to the rock garden from Friday night at 6:30 p.m. to Sunday at 6 p.m. The event requested to host a wine crawl for a few hours on Saturday night where patrons would purchase a commemorative glass for $25 and then would go from restaurant to restaurant to taste wine. The council denied this portion of the festival in 3-2 vote. 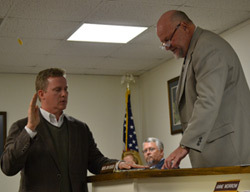 Judge Rodney Gibson has resigned as the City Court Judge and James Johnson, who has worked for 15 years as the Prosecuting attorney in the city court as well as other duties, was sworn in by Mayor Weaver. The ETC Franchise Tax agreement, which is up for renewal every seven years, was approved and states that 4% of gross sales within the city limits comes to the city as cable franchise fee. The city's Regional Commission has informed them that the ARC (Appalachian Regional Commission) will be severely limited or cut altogether and asked them to adopt resolution to support these programs to pass to senators and congressmen to lobby to keep these programs in place. The mayor emphasized that 30% of west end development (from Burger King to Walmart, Kroger and Captain D's) was paid by these federal grants from the ARC.